David Francis at the Christian Science Monitor write about an important point that I've raised periodically, and which gets far too little attention: the cost of immigration enforcement without reform. Beside the moral, humanitarian, and legal issues surrounding illegal immigrants, their apprehension poses a sizable financial cost. In Arizona, police could arrest them under the new state law, but keeping them in already crowded jails costs roughly $100 a day per person. For 5,000 people, imprisonment costs could add up to $182.5 million a year. That's a hefty charge for a state struggling with a budget deficit of at least $368 million. Presumably Arizona could save money by handing illegal immigrants over to the federal government for deportation. In fiscal 2008, the US deported 369,221 people. Deportations rose to 389,834 in 2009 under the Obama administration, and are predicted to reach 400,000 this fiscal year. Whether Washington will pay for more deportations is problematic. The United States deports each year less than 4 percent of its estimated 11 million illegal immigrants. At that rate, it would take more than two decades to deport all of them. One obvious conclusion is that even if the Arizona law is upheld, it simply won't be enforced. The ultimate irony is that the law was written precisely because the federal government was passing laws it could not enforce. States may well just be copying the blueprint of legislative failure. "They want to attribute the violence to me," Chavez said. "Violence is one of the visible and terrible effects of social injustice, of capitalism, of the model the bourgeoisie imposed on us." His basic argument, then, is that capitalism increases violence, and socialism decreases it. But if murder rates are either constant or rising in Venezuela, that means he is saying the country is either the same or more capitalist than when he took power over a decade ago. That might be true, though by this logic it means he is also saying that he isn't socialist at all, and has achieved no socialist goals. Wow. The State Department has apparently included the Obama administration's efforts to block SB 1070 as part of its human rights report to the United Nations High Commissioner on Human Rights. Although I find lots of mentions, I cannot find text of the report. The UN had previously expressed concern that the law violated human rights agreements the U.S. has already ratified. We already knew the administration's opposition to the bill, but acknowledging a controversial law as an international human rights concern is rare. So rare that I can't think of a precedent. It highlights Kathryn Sikkink's work on human rights and international institutions, where gradually human rights concerns gain traction even over very strong states. The probable angry reaction will also reflect the fact that in the U.S. we are very selective about when the UN should be influential and when it shouldn't. The survey of 1,500 people nationwide in late June and early July had a margin of error of plus or minus 2 percentage points, said Cabrera, who is vice president of the polling firm. He said the poll was financed by a group of private businesses, which he declined to identify. Polling is always controversial in Venezuela, but those commissioned by anonymous businesses that almost certainly hate Hugo Chávez are especially questionable. Both Brazil and Ecuador have echoed Colombia's rejection of the FARC's request to use Unasur as a forum for discussing the Colombian conflict. The argument was that it is not Unasur's place to do so unless requested by the Colombian government. They also indicated agreement with the government's demands that the FARC lay down arms, etc. before there are any talks. I maintain that this is a regional problem that needs a regional response, but the fact that other countries affected by the FARC are standing with Colombia is a positive sign. With luck it could become part of regional coordination to end the conflict. The media doesn't mention it too often, but despite all the public tension, the governments of Colombia and Ecuador have been working together closely in fighting the FARC since Colombia bombed Ecuador. Even the State Department's recent Country Reports on Terrorism made extensive note of Ecuador's efforts. Very interesting piece in the New York Times about putting academic journal articles online for peer review. Normally, a manuscript gets several anonymous reviews, at which point the editor (e.g. me at The Latin Americanist) decides whether to accept (very rare), revise and resubmit, or reject. Mixing traditional and new methods, the journal posted online four essays not yet accepted for publication, and a core group of experts — what Ms. Rowe called “our crowd sourcing” — were invited to post their signed comments on the Web site MediaCommons, a scholarly digital network. In the end 41 people made more than 350 comments, many of which elicited responses from the authors. The revised versions were then reviewed by the quarterly’s editors, who made the final decision to include them in the printed journal, due out Sept. 17. My first reaction is that there is a "too many cooks" element here. As an editor at even a small journal, I can tell you it is very time consuming to read through both the articles and the reviews. 350 "mini-reviews" per article manuscript means trying to sift through too much. But it is not only the bulk--it is also about trying to figure out the qualifications of the people making those suggestions. When I solicit reviews, I've spent quite a lot of time verifying that the reviewer is qualified. See more at The Monkey Cage, with the idea that people could register and comment on articles when they're published, which sounds intriguing and with good moderation could spark interesting debates. It is frustrating to hear a member of Congress keep repeating things that are simply not true. I've written before about Rep. Sue Myrick, who thinks terrorists come through Venezuela and then cross the Mexican border to attack us. She is going around town repeating this and similar stories. Myrick repeated what she wrote in a June 23 letter to Homeland Security Secretary Janet Napolitano: that Hezbollah has increased its cooperation with Central American drug cartels and poses a threat to security on the southern U.S. border. Myrick said she worries about Iranians learning Spanish and slipping through the border. Does is matter to her that even the Department of Homeland Security says she is wrong? Apparently not. But Homeland Security spokeswoman Amy Kudwa said Tuesday that, "At this time, DHS does not have any credible information on terrorist groups operating along the Southwest Border." The frustrating thing is that people believe what members of Congress say, then go repeat them, thus further poisoning the debate over immigration reform (and even U.S.-Latin American relations). Along more or less the lines I mentioned yesterday, the Colombian government rejected the FARC's suggestion of using Unasur as a forum for dialogue. "What the Colombian government demands of the guerrilla is that they free all the hostages without condition, that they cease the activity of kidnapping, and that of planting land mines, and they cease the recruitment of children, which is a modern expression of slavery. Moreover they must be able to demonstrate to the Colombian public that violence is senseless," Garzon said. The government also argued that it preferred bilateral, rather than multilateral, negotiations. This isn't a tenable position, however, given the fact that the conflict spills over into neighboring countries. Like it or not, it's a regional problem. The FARC has written a letter (text here) asking Unasur to act as mediator with the Colombian government. It is pretty surreal. All the FARC wants is "peace with social justice" and it is tired of always being asked to make unilateral concessions (by which I guess it means why should it give up some juicy hostages for nothing?). So it wants Unasur to provide it with a forum through which it can make its own vision of the Colombian conflict known. I think President Santos' stance has been pretty clear, namely that before any negotiation the FARC will have to make unilateral concessions, such as releasing hostages. I don't see a problem with providing a forum for establishing guidelines for dialogue. It could even backfire for the FARC, which has virtually no sympathy anywhere, and so a rant would weaken its position even further. Two days ago I discussed concerns about coups occurring in Latin America. In Ecuador, for example, 39% believed that a coup was likely in the next twelve months. Yet we also see that an August 2010 Cedatos/Gallup poll shows Rafael Correa with a 53% approval rating, which has been steady since May. So we have the unfortunate situation in which Rafael Correa is the most popular president Ecuador has had in some time, he has been in power for over three years after a revolving door (he was the seventh president in a decade) and the military has remained quiet, yet people think it is entirely likely he'll be overthrown anyway. Guillermo O'Donnell has written a lot about citizenship in new (or re-emerging) democracies. People must feel engaged and believe they are benefiting from democracy. In the case of Ecuador, the approval rating is a crude measure, but certainly suggests people do believe that. Yet based on a recent history of coups, they are skeptical about whether it will last. That may not come until several presidents have served their full terms, then left office peacefully. I guess I'm glad to see Alberto Gonzales arguing for immigration reform, but his Washington Post op-ed is so vague as to be useless, and utopian to the point of caricature. This lack of details is frustrating giving the fact that he was Attorney General and should be able to rattle them off. Instead, we need a policy that is "robust," "fair," "practical," "streamlined," "enforceable," and "capable of effective implementation without enormous delays or many mistakes." I just kept thinking about I Had Trouble in Getting to Solla Sollew, currently one of my daughters' favorites. Gonzales envisions a place where there aren't any troubles, or at least very few. But he does not explain how to get around the Skritz or the Skrink. Flacso (the Facultad Latinoamericana de Ciencia Sociales) has just released a region-wide poll, "Gobernabilidad y convivencia democrática an América Latina." It is not too uplifting. For example, 43 percent do not feel safe in their community. There is also the question of whether respondents believe a coup will occur in the next 12 months. Here are the percentages of people responding "likely" or "very likely." Mexico is surprisingly high. Despite concerns about how the military would act once the PRI was out of power, I have not heard rumblings about a coup, and despite drug-related violence the political system is holding together. Overall, these numbers are just too high, and they cross ideological lines. People do not necessary want a coup (though only 49% believe coups should never occur) but their belief in the resilience of democracy has shallow roots. Enforcement of immigration laws is expensive, something voters don't tend to take into consideration. Now in Fremont, Nebraska they are also discovering that defense against lawsuits is also pricey. For a proposed law along similar lines as Arizona, city officials say they need a property tax increase averaging $116 on a $200,000 home. To be clear here, residents will get a sizable tax increase and nothing in return. It all goes into the pocket of the guy who a) acts as lawyer for the city; and b) wrote the law. It is, in sum, a tax increase intended almost solely to make a local Republican lawyer more wealthy. One of the more interesting aspects of the Obama administration's decision to ease some specific types of travel to Cuba is that all it does is return to Clinton-era rules. The usual suspects argue that this will give a boost to the regime, when in fact its impact will be almost exactly nil. Perhaps it has some symbolic value, as the administration clearly is open to at least the idea of liberalizing relations, but simply switching back to a decade ago will not change U.S. policy toward Cuba too much. Yet as John McAuliff at The Havana Note points out, it is plausible that more will happen after the midterm elections. Some of the Republicans who win seats may well want more access to Cuba for businesses. We'll see how ties to other issues--some of the Cuban Americans Obama needs for immigration oppose liberalization. Via Americas Quarterly: a new Peru presidential poll. Further, 50% believe that her education in the U.S. was paid for by state funds, whereas 38% think the investigation is just a ploy to discredit her. The issue of dipping into state funds while acting as first lady is long-standing and will keep dogging her. How much Peruvians will care is another question. The illogic of the new border security measure goes in several different directions. Here is one more. We want immigrants to stand in line and come to the country legally. Yet to increase border security we will now make it harder for you to get in that line in the first place. The cost of the legislation is offset by a hefty increase in fees paid primarily by technology companies that hire highly skilled foreign workers under the H1B visa program. Those firms with more than 50 workers and with more than 50% of those employees from abroad would see the current $320 fee per visa application jump to $2,000. Backers of the fee increase argued that it would help create more U.S. jobs in competitive sectors like technology. Good--we don't want all those annoying Ph.D.s coming to our country anyway. Two observations about the border security bill that Obama will sign today, and I've made both before. First, this will not lure members of Congress to support immigration reform because they suddenly think you're "serious" about securing the border. They will still oppose it. Second, Chuck Schumer should not be the point man for immigration reform. In March he was the one arguing simultaneously that illegal immigrants take away jobs, but somehow we need them to do so. Now he is repeating the falsehood that the border is extremely violent, which study after study shows is untrue. According to Schumer, the money will provide "the boots on the ground and the resources necessary to combat the crime and violence." No. The U.S. side of the border is not violent or crime-ridden. And although the Mexican side has become more violent, U.S. boots can't hit the ground there. FYI, if anyone writes a comment and it does not appear, I actually get it via email but apparently it does not always show up on the blog itself--I do not know why. When this has happened in the past, the comment has shown up eventually. I am not deleting anything. I really enjoyed Gabriel Thompson's new book Working in the Shadows: A Year of Doing the Jobs [Most] American Won't Do. Back in 2007 I reviewed his book There's No José Here. To highlight the plight of low wage immigrant workers, he gets a job picking lettuce in Yuma, Arizona, then in a chicken factory in Russelville, Alabama, and finally a restaurant in New York City. I feel like someone must have crept into my bedroom overnight and beaten me on the back with a two-by-four, then continued pounding on the soles of my feet. I swallow several painkillers and put in my contact lenses, noticing that my eyes are bright red. My neck is also crimson; I'm lathering myself with sunscreen twice a day, but it doesn't stand a chance against my overactive sweat glands. There's a also a tennis-ball-size bruise on my right thigh, where the gancho jabs each time I bend (p. 29). For all three jobs, he wanted to quit early and was relieved when it was done, acknowledging the privilege he had in doing so, when in fact others were doing two such jobs at the same time to make ends meet. It should surprise no one that there are also all sorts of abuses (interestingly, the lettuce picking had the least) as well. I spend the following week tearing breasts. I figure a conservative estimate has me going through a breast every four seconds, or 7,200 breasts a shift. I arrive home each morning with throbbing hands, sleep fitfully throughout the day (I never manage to sleep more than five hours at a time), eat some food, take my ibuprofen, and wait for Kyle to pick me up to start all over again (p. 145). In New York City he gets a job for a company that delivers decorative trees, but is quickly fired because, as they put it, he was a "happy chicken." He figured his efforts at banter with other workers made them nervous. As in Yuma, simply being white makes everyone suspicious. Then he gets a job as a bicycle delivery man for a Mexican restaurant. Especially after talking to others who do delivery, he notes "It quickly became obvious that I don't need to 'investigate' the prevalence of illegal wages in the food delivery business. That's all there is" (p. 270). He ends with a list of possible policy solutions, though I felt that was rushed and not well developed. At any rate, the suggestions have been out there a long time--immigration reform, enforcement of minimum wage laws, right to organize unions, etc. Sadly, it just doesn't happen. But the next time you have a salad, think of the person who might have been the last to touch the lettuce, only 2-3 days before. Could you handle that job? Ortega has Forrest Gumped himself onto all the major battle lines of the struggle that dethroned dictator Anastasio Somoza in 1979, carried the Sandinista movement to power and radically changed Nicaraguan history. Orlando J. Pérez, John A. Booth, and Mitchell A. Seligson, "The Honduran 'Catharsis.'" AmericasBarometer Insights 45 (2010). In 2010, mean levels of "triple disatisfaction" had fallen back to 2006 levels after rising considerably in 2008. The authors thus argue that the coup created a "catharsis" effect. They also note, however, that this catharsis is felt almost entirely by economic elites. Not surprisingly, elites are less dissatisfied and don't support a coup because their interests are not longer threatened. In 2010, in contrast, with the new administration in power, elites were more supportive of the economic performance of the regime than those in lower wealth quintiles. Elites, however, expressed far more support for coups than Hondurans in lower income quintiles, which suggests that the coup proved satisfactory to the interests of wealthier Hondurans, and reinforced their view that unpopular economic policies can be “cured” by unconstitutional means. That, in fact, is the most important lesson to be taken from the coup. It is, of course, a very old story. I read Craig Mullaney's The Unforgiving Minute: A Soldier's Education, and enjoyed it. It is a memoir about how Mullaney went to West Point, then to Oxford, and finally to Afghanistan in the early period of the war. It is a very personal, nuanced and uncompromising view of what being an officer means. As he is aware, he is therefore opening himself up to criticism regarding his judgment and decisions--read some of the Amazon reviews to get a sense of them (those reviews tend to be either very positive or very negative). Mullaney is at his best when discussing Afghanistan, and how training, intellectual development, courage, leadership, fear, and friendship all blend together in a sometimes dizzying manner. In particular, the death of a private under his command soon after he arrives forces him to think hard about what leadership means--and, I would bet, thinking about that young man's death is what later played a large part in deciding to write the book. It is also interesting to read about the connections between training (such as at West Point) and combat--the seemingly pointless rituals and extreme attention to detail in the former are important, albeit indirectly, in the latter. Another theme of the book is the relationship between intellectuals and the army. Mullaney loves reading and learning, and spends a lot of his free time reading. At times that creates friction as others believe that reading is time not spent training, and even leads to a testosterone-pumped boxing match in Afghanistan. My only critique is that the book is too long. In the middle I got tired of the rowing stories at Oxford, for example, which seemed not to connect much to the rest of the story and I found them pretty dull--if you read it, feel free to skim that part and you won't lose much. One last point, for anyone out there thinking of having an affair: be careful, or your son might write a best-selling book that makes reference to it. Here is the text of Fidel Castro's message to the Cuban legislature. Here is video. One of the most interesting aspects of the speech (aside from its uncharacteristic brevity, which has been widely noted) is that it in a time of economic reform in Cuba, his words focused only on foreign affairs. I would think that current economic reforms are far more relevant to the average Cuban than U.S. policy toward Iran. That raises the question of whether a) he simply does not support those reforms so chooses not to mention them; or b) he was asked not to mention them. As for the foreign affairs, times change, I guess. In 2010 Fidel discusses the dangers of nuclear war, whereas in the early 1980s he wanted the Soviets to launch one. Huyen Pham and Va H. Pham, "The Economic Impact of Local Immigration Regulation: An Empirical Analysis." Forthcoming from Cardozo Law Review (h/t ImmigrationProf Blog). A wave of local anti-immigration laws has swept the country, triggering contentious debate and raising significant legal and policy issues. One critical dimension that has been largely ignored, however, is the economic impact of these laws: are jurisdictions with them better off economically than those without them? In the first empirical study of this issue, we analyze the economic impact of these laws. The laws take different forms - some authorize local police to enforce federal immigration laws, some restrict benefits like housing and employment to those with legal immigration status, and some require all government transactions to be conducted in English only. Applying statistical analysis to economic data from the U.S. Census Bureau, we find such laws resulted in a 1 to 2 percent drop in employment, or 337 to 675 lost jobs for the average county. This drop in employment includes both authorized and unauthorized workers. We also find that the laws hurt some industries, such as the restaurant industry, while helping others, such as the grocery and liquor store industry. This suggests that affected workers may be switching jobs, rather than leaving a particular jurisdiction altogether. Because local immigration regulation has such profound policy impact, local governments considering the efficacy of these laws need to base their decisions on empirical evidence, not assumptions, about the laws’ effect. This Article provides crucial information for that decision making. So a negative effect, but not very drastic. This is really interesting, and more of these sorts of studies should be conducted to tease out the ways in which local immigration laws affect communities. I don't really understand how the laws benefit liquor stores, though I do sometimes cry in my beer. Latin American Barometer, a comparative public opinion survey that has tracked political attitudes since 1995, reveals that if anything, the region has made a marked shift toward the center. In 2002, 29 percent of Latin Americans identified themselves as centrists; by 2008, that number had jumped to 42 percent. I agree, but I think his argument needs more explanation. The "shift" should be viewed in a long-term, historical context as a gradual recovery from the Cold War. In other words, that "jump" is better understood as part of a slow process rather than a sudden phenomenon. But this is the sort of analysis we need, rather than the ideologically-driven arguments about the region moving left or right. It's not surprising, given the region's history, that some measure of political moderation should have taken over in more prosperous times. Actually, I disagree with that. It is notable that so many countries remain fairly moderate even in times of economic crisis, especially if you expand the analysis to the entire post-Cold War era. It might just be that I am tired of reading analyses that suggest Latin American politics is like a ping-pong match that jerks each direction every few years. (Boz writes about Shifter's article too, though as with Shifter I agree with him only partially--left and right does matter, just not as much as many claim). If you read the State Department's recently released Country Reports on Terrorism 2009 Western Hemisphere Overview something stands out immediately--outside Colombia there are few terrorist threats in the region. This is good news that deserves more attention. Even the section on Venezuela is pretty mild stuff, and it admits that Venezuela actually has worked with Colombia on counterterrorism. No known international terrorist organizations had an operational presence in Mexico and no terrorist incidents targeting U.S. interests and personnel occurred on or originated from Mexican territory. Alarmism is juicy. It grabs people's attention, makes for wonderful sound bytes and goes viral until people believe it. But in this case it is unwarranted and can lead to poor policy decisions. The issue of student plagiarism has been a hot topic recently, and in particular a story in the New York Times made email rounds. The basic argument is that the young generation of today is so immersed in technology that its members happily plagiarize more than past generations, sometimes without even knowing it. I don't buy it, so I wish we could stop the hand-wringing. I have a pet peeve about arguments criticizing the current generation versus the past. Growing up, I read plenty about Gen X, the ridiculous moniker for my own generation, that made no sense to me at all. Now we hear all about "Millenials" and all their problems. Well, I want data, and it is in short supply. The NYT article, for example, was based primarily on talking to some people at three different universities. I recommend Miguel Centellas' blog post on the topic. I agree that plagiarism is a constant, and technology actually makes plagiarism easier to spot than in the past. I have yet to see data showing that students understand plagiarism less than past generations, or that they have a different view of ownership. However, as I creak toward middle age (or am I already there?) I do understand how easy it is to romanticize the past. When I was in college, for example, I stopped studying only to help the old and infirm cross the street. I refused to play video games because they were un-intellectual and I read novels only if they were over 400 pages because my attention span was so long. More bad news for Sebastián Piñera, this time from Adimark. In the past month, his approval dropped from 52% to 46%, while disapproval jumped from 34% to 40%. Approval of the government's job in general fell from 57% to 49%. A senator from Renovación Nacional tried to blame Piñera's numbers on problems--particularly healthcare and Transantiago--he inherited from Michelle Bachelet. 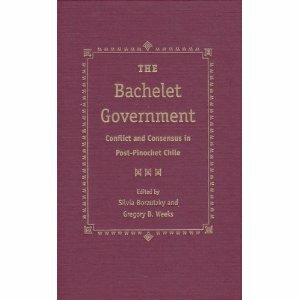 Yet Bachelet was popular despite these issues. And anyway, fair or not it's irrelevant. He's the president now. Yet there is an upside for him. While 41% approve of the governing coalition (with 43% disapproval) there is only 33% approval of the Concertación (and 52% disapproval). So Piñera has problems, but the Concertación is not in a good position to take advantage of them. The funny thing is that I've written that many times when the coalitions were in opposite positions. And as a political scientist, I also have to admit that these numbers can't tell us much about long-term trends. But they're fun. First, polls show that Latin America has remained quite centrist ideologically, regardless of individual elections. Second, she admits that the Chilean election was based almost entirely on non-ideological issues. Third, her claim that Colombians voted for Juan Manuel Santos because of Hugo Chávez is not convincing. Fourth, you cannot compare the Honduran election to other elections in the region, given the repressive context. And she misspelled "augur." I know that's petty, but it bugged me. Update: In comments Randy Paul also notes that she mentions "Francisco" Calderón. Nice. About 1,700 homicides have occurred in Juárez this year. El Paso has had one. Despite the rampant bloodshed in Mexico, the overall crime rate in El Paso has decreased slightly this year. Crime is not only not up, it is going down across the border from a Mexican city that is having incredibly serious problems. This is begging for fieldwork. Gregory B. Weeks and Silvia Borzutzky, "Introduction"
Peter M. Siavelis, "What it Takes to Win and What it Takes to Govern: Michelle Bachelet and the Concertación"
Robert L. Funk, "Parties, Personalities, and the President: The Challenges of the Bachelet Government's Political Narrative"
Gregory B. Weeks, "The Transition is Dead, Long Live the Transition: Civil-Military Relations and the Limits of Consensus"
Silvia Borzutzky, "Socioeconomic Policies: Taming the Market in a Globalized Economy"
Mary Rose Kubal, "Challenging the Consensus: The Politics of Protest and Policy Reform of Chile's Education System"
Kirsten Sehnbruch, "Unresolved Conflicts within the Consensus: Bachelet's Inheritance of Labor and Employment Issues"
Susan Franceschet, "Continuity or Change? Gender Policy in the Bachelet Administration"
Eduardo Silva and Patricio Rodrigo, "Contesting Private Property Rights: The Environment and Indigenous Peoples"
Aldo C. Vacs, "Conclusion. Paved with Good Intentions: The Bachelet Administration and the Decline of Consensus"
Capitalism and socialism in Cuba & the U.S. This BBC story about Raúl Castro and Cuban economic reforms made me think about how Cuba and the U.S. are in essentially opposite positions. The U.S. is overwhelmingly capitalist, and any increased role of the state in the economy leads to screams of socialism. Cuba is overwhelmingly socialist, and any decreased role of the state in the economy leads to screams of capitalism. In the U.S., policy makers cannot say they are implementing socialist reforms. In Cuba, policy makers cannot say they are implementing capitalist reforms. Critics blame capitalism for economic problems in the U.S. Critics blamed socialism for economic problems in Cuba. And in both cases, despite lots of hot air, nothing much changes. I agree, but I would add more for a regional context. The administration has continually expressed support (albeit tepid) for FTAs with Colombia and Panama, but treatment of labor has slowed them down to almost a halt. By taking such a measure, the administration is also sending a signal to those who oppose those FTAs that it will take labor issues seriously. Ironically, despite the fact that Mexico City is the reference for Paco Ignacio Taibo II's Return to the Same City, there is less description of it than in many of his other novels, and more action takes place outside it. The story revolves around a woman who hires Belascoarán Shayne to investigate her sister's murder (with the implication that he should kill the murderer). Because of a recent attack on him, however, Shayne lives in a sometimes surreal state of paranoia that leaves him, among other things, suddenly finding himself on airplanes when he doesn't remember buying the ticket or boarding. Then into this compact book we find crammed weapons sales to the Nicaraguan Contras, the guy who cut off Che Guevara's hands, a large band of mariachis, a CIA agent and some baby ducks. He just manages to pull it back from the brink of unbelievability. It is an entertaining story, and takes you all over Mexico. Taibo makes a point at the beginning of the book to explain that the historical setting includes the rise of Cuauhtémoc Cárdenas's presidential campaign, though subsequently there were only scattered reference to him. That is unfortunate, because he has such a keen sense of politics. is now out. It is priced for libraries, but keep it in mind as a birthday or holiday present. Nothing says "I love you" like an analysis of Chilean politics.